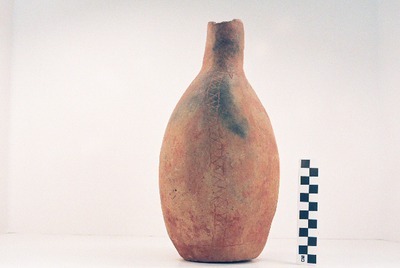 DECORATION (INCLUDING MOTIF AND ELEMENTS WHEN APPARENT): There are single horizontal engraved lines below the bottle neck and above the base. The upper horizontal engraved line has a series of cross-hatched engraved pendant triangles. Between the two horizontal lines are four vertical engraved bands filled with cross-hatched engraved lines. Hume Engraved, var. unspecified bottle from the Jim P. Allen site.